A panel proposal should address a test-related 'hot' topic that is of substantial interest to the majority of ETS attendees because it is controversial or increasing in importance. 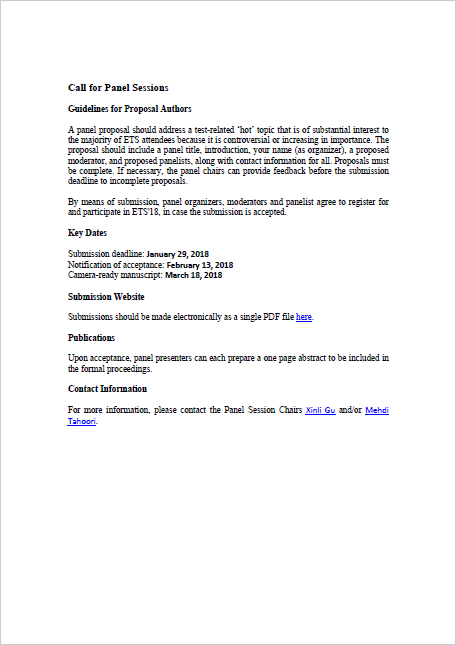 The proposal should include a panel title, introduction, your name (as organizer), a proposed moderator, and proposed panelists, along with contact information for all. Proposals must be complete. If necessary, the panel chairs can provide feedback before the submission deadline to incomplete proposals. By means of submission, panel organizers, moderators and panelist agree to register for and participate in ETS'18, in case the submission is accepted. Upon acceptance, panel presenters can each prepare a one page abstract to be included in the formal proceedings. For more information, please contact the Panel Session Chairs Xinli Gu and/or Mehdi Tahoori.